Tidal and wind-driven surface currents in the German Bight between shallow mudflats of the North Frisian islands and the island of Helgoland are studied using coastal high-frequency radar (HFR) observations and hindcasts from a primitive equation numerical model. The setup of the observational system is described, and estimates of expected measurement errors are given. A quantitative comparison of numerical model results and observations is performed. The dominant tidal components are extracted from the two data sources using tidal harmonic analysis and the corresponding tidal ellipses are defined. Results show that the spatial patterns of different tidal ellipse parameters are consistent in the two data sets. Model sensitivity studies with constant and variable salinity and temperature distributions are used to study density-related mechanisms of circulation. Furthermore, the role of the surface wind field in driving the German Bight circulation is investigated using the complex correlation between wind and surface current vectors. The observed change of the respective correlation patterns from the coastal to open ocean is shown to be due to a combination of density effects, the coastline and topography. 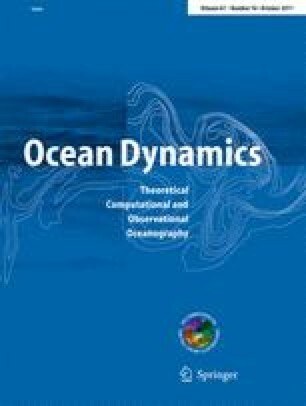 The overall conclusion is that HFR observations resolve the small-scale and rapidly evolving characteristics of coastal currents well in the studied area and could present an important component for regional operational oceanography when combined with numerical modelling. Some unresolved issues associated with the complex circulation and large instability of circulation in front of the Elbe River Estuary justify further considerations of this area using dedicated surveys and modelling efforts. HF radar observations were provided by the German national research project PRISMA (BMFT-Projekt 03F0558A1). This work was supported by the FP7-SPACE-2009-1 nr. 242284 project FIELD-AC (Fluxes, Interactions and Environment at the Land-Ocean Boundary. Downscaling, Assimilation and Coupling) in cooperation with the German COSYNA (Coastal Observing System for Northern and Arctic Seas) project. We are grateful to anonymous reviewers for the useful comments and advice on how to improve the paper.